KiCad is the electronic design automation software that lives at the intersection of electronic design and open source software. It’s seen a huge push in development over the last few years which has grown the suite into a mountain of powerful tools. To help better navigate that mountain, the first ever KiCad conference, KiCon, is happening next week in Chicago and Hackaday is hosting one of the afterparties. The two days of talks take place on April 26th and 27th covering a multitude of topics. KiCad’s project leader, Wayne Stambaugh, will discuss the state of the development effort. You’ll find talks on best practices for using the software as an individual and as a team, how to avoid common mistakes, and when you should actually try to use the auto-router. You can learn about automating your design process with programs that generate footprints, by connecting it through git, and through alternate user interfaces. KiCad has 3D modeling to make sure your boards will fit their intended enclosures and talks will cover generating models in FreeCAD and rendering designs in both Fusion360 and Blender. Dust off your dark arts with RF and microwave design tips as well as simulating KiCad circuits in SPICE. If you can do it in KiCad, you’ll learn about it at KiCon. Of course there’s a ton of fun to be had as interesting hackers from all over the world come together in the Windy City. Hackaday’s own Anool Mahidharia and Kerry Scharfglass will be presenting talks, and Mike Szczys will be in the audience. We anticipate an excellent “lobby con” where the conversations away from the stages are as interesting as the formal talks. And of course there are afterparties! Saturday 4/27: Hackaday is hosting an after party at Jefferson Tap from 6-8:30. We’re providing beverages and light food for all who attended the conference. If you still don’t have a ticket to KiCon, you better get one right now. We’re told that you can count what’s left on two hands. Supplyframe (Hackaday’s parent company) is a sponsor of KiCon, and we have two extra tickets that came with that sponsorship. We like seeing a diverse community at these events and have saved these tickets for people from under-represented groups (such as for example women, LGBT+, and people of color) in the hardware world. Email us directly for the tickets, your information will remain confidential. We’re looking forward to seeing everyone next week! You can now make flexible circuit boards of unlimited length. Trackwise was contracted out for making a wiring harness for the wing of a UAV and managed to ship a 26 meter long flexible printed circuit board. This is an interesting application of the technology — UAVs are very weight sensitive and wiring harnesses are heavy. Wings are straight, but they flex, and you need wires going from tip to tip. Flex circuits do all of this well, but first you need a technology that allows you to manufacture circuits that are as long as a wing. This is apparently something called ‘reel-to-reel’ technology, or some variant of continuous production. Either way, it’s cool, and we’re wondering what else this kind of circuit enables. You may have noticed a few odd-shaped buildings going up in the last few years. These are buildings designed for indoor skydiving. Two went up around DC in the last year or so. What if you didn’t need a building? What if you could make an outdoor, vertical wind tunnel? Here you go, it’s the Aerodium Peryton. KiCon, the first and largest gathering of hardware developers using KiCad, is happening April 26th in Chicago. If KiCad isn’t your thing, PyCon is in Cleveland May 1-9. It couldn’t come at a better time: after losing LeBron, the Cleveland economy has plummeted 90%. Cleveland needs an industry now, and tech conferences are where it’s at. Go Browns. For one reason or another, a few tech blogs wrote about a product on Tindie last week. It’s the SnapOnAir Raspberry Pi Zero PCB. This turns a Raspberry Pi Zero into a tiny, battery-powered handheld computer with a keyboard and display. This is just a PCB, and you’ll need to bring your own switches, display, and other various modules, but it is a compact device and if you need a small, handheld Linux thing, this is a pretty good solution. Oh noes April Fools is tomorrow, which means the Internet will be terrible. Tip ‘o the hat to Redbox, though: they were the only one that sent out a press release to their waste of electrons by last Friday. CircuitPython is becoming a thing! CircuitPython was originally developed from MicroPython and ported to various ARM boards by Adafruit. Now, SparkFun is shipping their own CircuitPython board based on the nRF52840, giving this board an ARM Cortex-M4 and a Bluetooth radio. You like contests, right? You like circuit boards too, right? Hackster.io now has a BadgeLove contest going on to create the Blinkiest Badge on Earth. Yes, this is a #badgelife contest, with the goal of demonstrating how much you can do in a single circuit badge. Prizes include a trip to San Francisco, a badass drone, a skateboard, a t-shirt, or socks. YES, THERE ARE SOCKS. We have a date for the Vintage Computer Festival Pacific Northwest 2019. It’s going down March 23 and 24 at the Living Computers Museum in Seattle. The call for exhibitors is now open so head over and check it out. So far the tentative list of exhibits and presenters include Attack of the SPARC Clones, and I must mention that SPARC systems are showing up on eBay with much higher frequency lately. I have no idea why. Need another con? How about a KiCAD con? The inaugural conference for KiCAD users is happening next April in Chicago and the call for talk proposals just opened up. The con focuses on topics like using KiCAD in a manufacturing setting, what’s going on ‘under the hood’ of KiCAD, and how to use KiCAD to make an advanced product. Spanish police have stopped a homemade scooter. Someone, apparently, was tearing around a public road in Galacia on a homemade scooter. From the single picture, we’re going to say ‘not bad.’ It’s a gas-powered weed wacker mounted to a homemade frame. Every year, in December, we take a look back at what Hackaday has accomplished in the past twelve months. Sure, we gave out hundreds of thousands of dollars in awards in the Hackaday Prize, and yes, we’ve pushed our coverage of tech advancements into weird, uncharted, but awesome territory. Our biggest accomplishment, though, is always how many readers we reach. 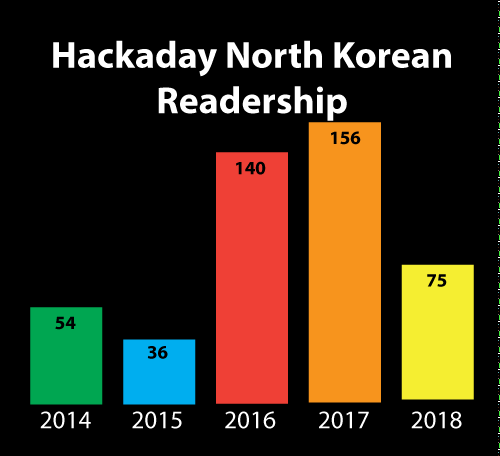 This year, we had a slight fall-off in our readership in the Democratic People’s Republic of North Korea. We’re down from 156 views in 2017 to 75 views this year. While the year isn’t over, we don’t expect that number to change much. What was the cause of this drop-off? We’re not quite sure. Only time will tell, and we’re looking forward to serving fresh hacks every day to the DPRK in 2019.